#FantasticObjects Tweet Up with National Museum of American History! Join us for a Tweet Up with the National Museum of American History and Smithsonian Libraries! Friday, August 7, 9:00-10:30 A.M. (EDT). To celebrate the opening of the Innovation Wing in the Smithsonian’s National Museum of American History, 10 lucky Twitter followers will have the opportunity to experience a special tour of two of the wing’s exhibits led by Smithsonian experts and a behind-the-scenes tour of the Dibner Library of the History of Science and Technology. 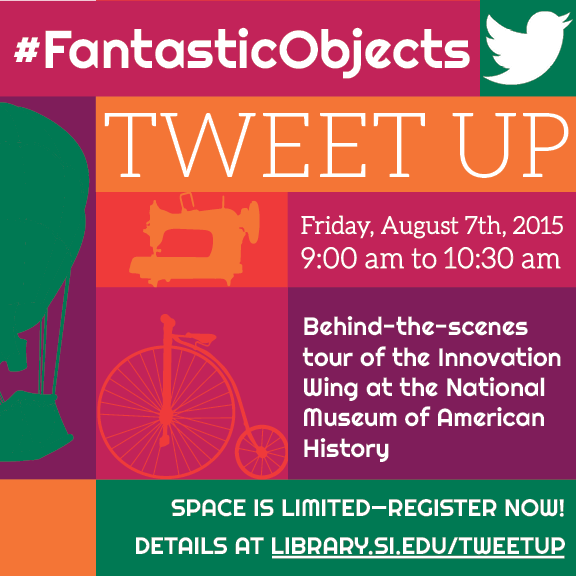 Continue Reading#FantasticObjects Tweet Up with National Museum of American History! On September 2nd, 2014, the day after the 100th anniversary of the death of Martha, the last passenger pigeon, the Smithsonian Libraries , National Museum of Natural History (NMNH) and Biodiversity Heritage Library (BHL) hosted a twitterchat in honor of the beloved bird. The chat featured Helen James, Curator in Charge of the Division of Birds at NMNH and Martin Kalfatovic, program director of BHL, who contributed for their respective organizations.